A monument commemorates all Germans who were interred at the former Trial Bay Gaol. Trial Bay Gaol was reopened in 1915 and used to intern Germans during World War One. The anti-German feeling at the time had led to the rounding up of innocent Germans. Although life was hardly pleasant the Germans established their own band, turned part of the gaol into a tennis court and one visitor described the nights as being more like a pleasant beer hall than a prison. Prison here was abandoned in May 1918 and internees were taken to Sydney by train, marching through Kempsey to the station after being brought to the town by boat. The original monument was blown up. 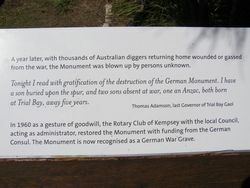 The residents or Kempsey have blown up a monument that was erected to deceased Germans at Trial Bay. The monument had been the cause of frequent protests by local bodies, including the Returned Soldiers League. In a recent reply to representations by Mr. H. D. Morton and Mr. John Thomson, the Acting Prime Minister stated that when permission was given for the erection of the monument, instructions were issued that it was not to be of a large or conspicuous nature, or to be visible from any great distance. Several threats had been made that it would be destroyed. The monument was partly shifted on Monday, and finally destroyed on Thursday. It was built of solid granite, it was 20ft high and 10ft square at the base, and was in three tiers of solid granite, each 12in thick. 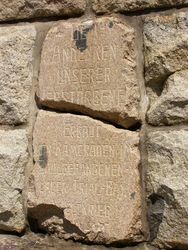 On the side facing the Pacific Ocean was a large tablet, inscribed in German, and there are four graves on either side, each having inscribed slabs of polished granite, encircled with rounded kerbings 12in. wide. 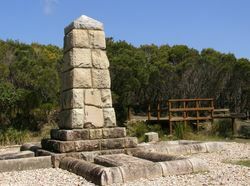 The monument occupied a most prominent position on the hill overlooking Trial Bay gaol. The graves are uninjured. The explosion did not extend lower than the first base stone. The Urana Independent and Clear Hills Standard (NSW), 11 July 1919. 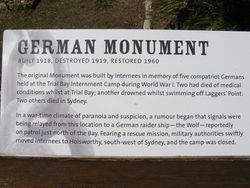 The original monument was built by internees in memory of five compatriot Germans held at Trial Bay Internment Camp during World War 1. Two had died of medical conditions while at Trial Bay; another had drowned off Laggers' Point. Two others died in Sydney. In a wartime climate of paranoia and suspicion, a rumour began that signals were being relayed from this location to a German raider ship - the Wolf - reportedly on patrol just north of the Bay. Fearing a rescue mission, military authorities swiftly moved internees to Holsworthy, south- west of Sydney and the camp was closed. 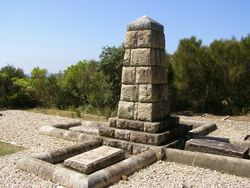 A year later, with thousands of Australian diggers returning home wounded or gassed from the war, the Monument was blown up by persons unknown. Tonight I read with gratification of the destruction of the German Monument. I have a son buried upon the spur, and two sons absent at war, one an Anzac, both born at Trial Bay, away five years. Thomas Adamson, last Governor of Trial Bay Gaol.